Peter Hickman on the Smiths Racing BMW at the Ulster Grand Prix. Peter Hickman is aiming to hit the ground running in 2018 after signing with the Gloucester-based Smiths Racing team for a second season. Hickman excelled on the S1000RR in 2017 in the MCE British Superbike Championship and at the international road races. Alongside his BSB commitments, he will again return to the North West 200, Isle of Man TT, Ulster Grand Prix and Macau Grand Prix next year. The 30-year-old was in hot demand after claiming a BSB Showdown place and impressing at the TT, where he never finished off the podium in all five main solo races. Hickman also clinched a hat-trick at the Ulster Grand Prix, winning both Supersport races and the Superstock event at Dundrod. However, despite interest from other leading teams, the Lincolnshire man chose to remain with Alan and Rebecca Smith’s family-run outfit for another year. “This will be the first time in my career I’ve stayed with the same team on the same bike, so I’m delighted to be back with the Smiths team and on the BMW for 2018,” Hickman said. “We had a great season this year and we can now hit the ground running which can only benefit us. We know we have a lot more to come so I can’t wait to get started and I genuinely feel I can push for the BSB championship next year. Hickman is joined in the team’s BSB line-up by French rider Sylvain Barrier, who will make his debut in the series. 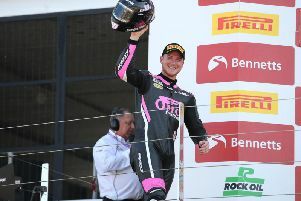 Barrier won the FIM Superstock Cup in 2012 and 2013.